The Q4 2009 GDP figures released on February 15, 2010 showed a growth of 1.1% q-o-q or 4.6% on an annualized basis. The Japanese economy thereby confirmed the recovery with a third consecutive quarter of real growth. The recovery trend is also confirmed by January industrial production increase which after a Q4 2009 4.5% q-o-q growth increased 2.5% m-o-m, with expectations for all Q1 2010 now at 5% q-o-q. Main reason for this robust recovery is the growth in Asian economies on which basis the exports of Japan already started growing again from the 2nd Q of 2009. Already then exports to Asian countries grew by 18.9%. Real Exports in Q2 and Q3 grew by double digit and by 7.5% in Q4 2009. Unemployment fell to 4.9% in January 2010 and household spending has risen y-o-y for the sixth month. Real consumer spending grew 0.7% q-o-q in Q4 after 0.6% during the previous quarter. The Japanese government has committed in total the equivalent of 4.2% of the country’s nominal GDP in stimulus measures, the largest of any G 20. The before mentioned growth in consumption spending at a time when employee remuneration fell by 0.4% suggests that such policies are paying off. On gross basis governmental debt has increased to close of 200% of GDP. While the government will have to find ways to reduce this debt burden, Japan is still far away from a financial crisis that other debt burden countries are facing presently. While most other debt burdened countries rely heavily on external investors, Japan debt is refinanced mainly from domestic sources. Japanese private households command 1.5 trillion US$ in financial assets, about 3 time the amount of national GDP. Over 50% of this money is placed in bank deposits. Thereby client deposit exceeding the lending volume of the banking industry by over 150% for the industry. Insurance companies hold 27% of such financial assets. This is providing both sectors with plenty of money to be invested in JGBs. State held financial assets add up to 50% of gross governmental debt. In other words on a net basis the government debt is half the size. The cost of Japans debt with JGB yields far below 2% since the second half of the 1990s (presently 1.3%) in relation to the country’s GDP is well below that of Germany who’s gross governmental debt is below 100% of GDP. Regardless of the March earthquake disaster the vacancy rates of the Tokyo CBD 5 Wards have shown a stabilizing trend in the first half of this year. The present rent level is stimulating office demand. Moves for expansion and to good-quality buildings have actually become popular. The market is getting back to normal from the financial crisis. Some voice concern about the office supply projected in Tokyo next year. However, regarding grade A office in Tokyo CBD, the supply will be moderate with just around 60% of the large 2003/04 supply. We expect that the market will digest this supply without any delay. 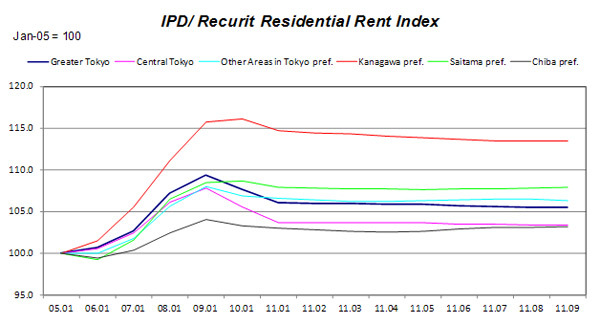 The rents in the Tokyo CBD 5 Wards have not bottomed out yet, recorded the lowest level for the last decade. According to CB Richard Ellis and Jones Lang LaSalle, the rent drop of grade A buildings in Tokyo CBD is slowing further. We expect that the rent level of those buildings will bottom out in around the middle of next year. In this March, when most of Japanese companies faced the end of fiscal year, many deals were closed as usual despite the disaster. There were some huge transactions in excess of JPY 30 billion. The purchases were mainly well-funded major Japanese real estate company, such as Mitsui Fudosan and Mitsubishi Real Estate, and the J-REITs sponsored by them. We could also observe notable deals constantly after this April. J-REITs held a dominating buyers position, among other reasons supported by successful new offerings and by governmental funds. The rent in the greater Tokyo has stabilized after its fall it has stopped from 2009 heights. Especially rents in Saitama and Chiba two very popular living areas show clear signs to have bottomed out in June this year. 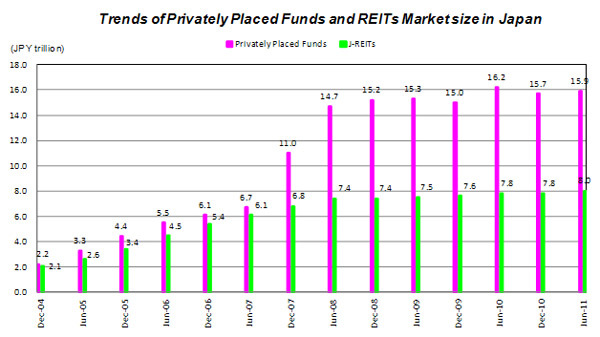 In june 2011 J-Reits and Private Funds jointly held JPY 23.9 trillion in Assets under Management (AuM). Despite the disaster of the Great Eastern Earthquake the institutional market grew by JPY 400 billion. 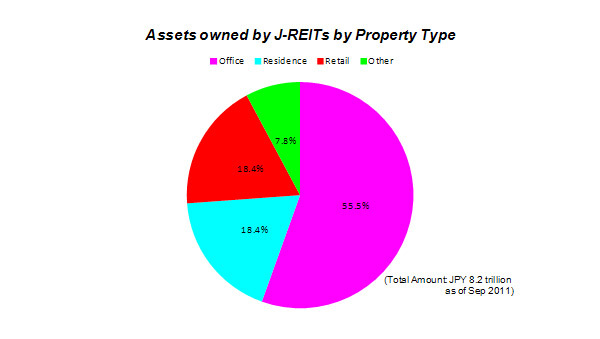 J-Reits AuM grew again by JPY 200 billion between June and September 2011 supported by fresh money raised from the capital market through public offerings.